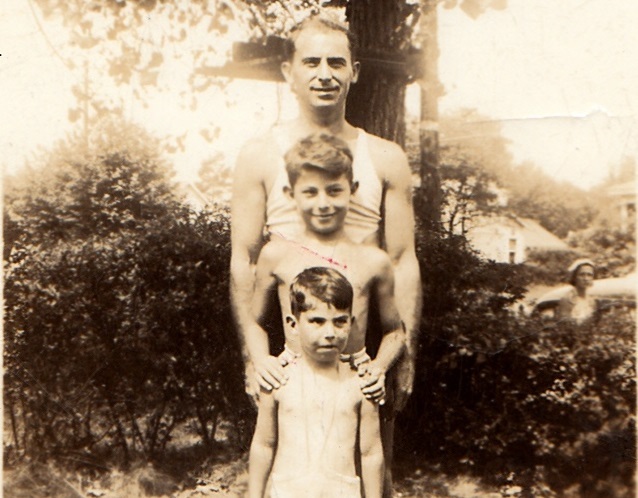 Herman Roth with his sons Sandy and Philip at Bradley Beach, NJ, in 1937. 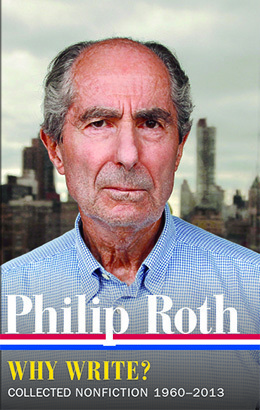 The photograph was used for the front cover of Roth’s 1991 book, Patrimony. I sat in the chair across from him, my heart pounding as though I were the one about to be told something terrible. “You have a serious problem,” I began, “but it can be dealt with. You have a tumor in your head. Dr. Meyerson says that given the location, the chances are ninety-five percent that it’s benign.” I had intended, like Meyerson, to be candid and describe it as large, but I couldn’t. That there was a tumor seemed enough for him to take in. Not that he had registered any shock as yet—he sat there emotionless, waiting for me to go on. “It’s pressing on the facial nerve, and that’s what’s caused the paralysis.” Meyerson had told me that it was wrapped around the facial nerve, but I couldn’t say that either. After a yearlong illness Herman Roth died in October 1989. In Patrimony Philip Roth accompanies his father through each stage of his final ordeal. Writing for The New York Times Book Review, the poet Robert Pinksy praised the book for telling “one of the central true stories many Americans share nowadays: the agonized, sometimes comic labor of a family and a dying parent who must deal with all the loyalties and grudges of their past while coping with their transformed future.” The book went on to win the National Critics Circle Award for biography. A year after the publication of Patrimony Roth became the first novelist to receive the New Jersey Historical Society award, given annually to “an individual or individuals who have made significant contributions to New Jersey history.” Katharine L. Auchincloss, the chair of the organization, praised Patrimony for chronicling “a community that existed for a short time. It is a wonderful look at that community—not sentimental, a rich and sharp sense of the city.” Roth’s speech accepting the award in his father’s name has been published for the first time in Why Write? Collected Nonfiction 1960–2013, the tenth and final volume in Library of America’s definitive Philip Roth edition, and we present it here as our Story of the Week selection. The person who should be standing here today to receive an award of honor from the New Jersey Historical Society is not the author of Patrimony but the subject of Patrimony, my father, Herman Roth. . . . If you don't see the full selection below, click here (PDF) or click here (Google Docs) to read it—free!